That's still a sharp contrast with Android: apparently, about 45 percent of Android users are running one of four versions of Ice Cream Sandwich (Android 4.x), according to data collected by mobile analytics firm, Mixpanel. The largest percentage is 28 percent for Android 4.1.2. According to some estimates, over 250 million iOS devices already have upgraded to Apple's radically redesigned mobile operating system in four weeks. 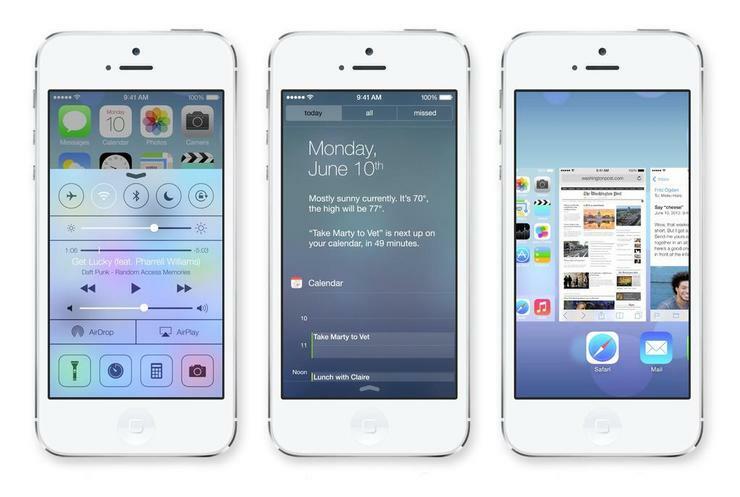 iOS 7 ramped up very quickly once it was released September 18, according to data tracked by Millennial Media, http://www.millennialmedia.com which sells a mobile advertising and data platform called MMX Ad Exchange. "After the first week, iOS 7 grew from having 0.5 percent of our total iOS traffic, to 16 percent of total iOS traffic," wrote Matt Gillis, Millenial Media's executive vice president, global product and platform, in a blogpost this week. It took less than four days for iOS 7 to surpass iOS 6 in their tracking. But by the end of week one, the rate of adoption slowed. "While the 185 percent daily growth for iOS 7 was impressive, we looked back at the first week of growth for iOS 6 and saw that it grew an average of 264 percent daily," Gillis wrote. "Additionally, while the release day impressions for iOS 6 and iOS 7 were similar, once the release was seven days out, iOS 6 saw significantly more adoption, and was at 35 percent of our total iOS impressions, compared to the 16 percent for iOS 7." Mixpanel's data shows a similar pattern of iOS 7 growth, with very strong adoption in the first week. By Oct. 1, iOS 7 penetration was at 65 percent. But from Oct. 1 to Oct. 18, the penetration rose much more slowly, to just over 72 percent. The Android universe is much less uniform, according to Mixpanel. This chart shows the relative penetration, to date, of the various Android versions. As noted about 45 percent of this sample is using some form of Android 4.x, or Jelly Bean. Less than a third, or 28 percent run 4.1.2. Less than 10 percent are running one of the three most recent 4.2.x releases. But this progress, according to John Koetsier in a Sept. 4 post at VentureBeat. "Just days after announcing the next version of Android, KitKat, and telling the world that a billion Android devices have been activated, Google updated what used to be Android's dirty little secret: fragmentation between various versions of the mobile operating system," Koetsier wrote. "And Android has never looked more unified." The somewhat slower growth of iOS 7 is likely due to a significant group of users delaying the update "after reading about how radical the changes were," according to Millennial Media's Gillis. That awareness also drove a big change in after-work-hours iOS 7 downloads. "While some consumers may have downloaded the update during work, they most likely saw the major changes and decided they needed to explore the new system away from the pressures of the workday," Gillis wrote. A story in USA Today this week claims that iOS 7 is "fast becoming its most troubled mobile operating system update, increasing concern that the technology giant has lost some of its magic touch since co-founder Steve Jobs passed away two years ago." But reporters Scott Martin and Alistair Barr cite only anecdotal evidence, drawn from a few end users and from comments and posts on online forums, which by definition are about problems or confusion. "Draining batteries, dropping Wi-Fi and spotty Bluetooth connections are getting big boos across discussion boards at Apple's own support communities," they wrote. "Some apps are working poorly or slowly, the interface is harder to use for some people, and game players have also found faults." A usability evaluation of iOS 7 this week, by Raluca Budiu, of the Nielsen Norman Group, concluded that the new design is a mixed bag. The "flat design" doesn't always give users a clear distinction between action/navigation and content; and "swipe ambiguity" the same gesture having different results in different locations can be confusing. On the plus side, Budiu says, is cloaking some Safari browser controls until a swipe makes them visible; background updates for apps; letting users change once the font-size for all apps that support this adjustment; and a "Settings" that is streamlined and easier to navigate.